Barkzilla: A Savvy NYC Dog Blog: Satisfy Your Pup's Dogolate Fix! While Barkistas for the most part can appreciate and enjoy the finer things in life, gourmet chocolates are not one of them. Because cocoa contains substances that are toxic to dogs, even the smallest amount can prove deadly. But our spoiled pups need not go without their chocolate fix—The Canine Confectionary Company’s Chudgy Chocs line of beautifully wrapped, luxury treats has something to satisfy every Barkista’s sweet tooth. Everything is cocoa-free (i.e. dog-friendly), and handmade to order from human-grade carob and milk-based ingredients. The original gourmet Chudgy Chocs treat, an exquisite metallic gold gift box containing either twelve or twenty four luxurious handmade Dogolates™. Each special box contains six unique Dogolate™ flavours; Blackberry Bombe, Banana Cupcake, Mint Leaf, Strawberry Rose, Peanut Butter Swirl, and Sweet Cherry BonBon. Packed with pieces of real fruit, nuts and herbs, and light rice flakes, these hand crafted treats offer a tasty, healthy and cocoa-free gourmet alternative to human confectionery for your dog. Two solid white Dogolate™ paw shaped lollipops in two pure and natural flavours, white strawberry and white mint, set onto chewy natural rawhide twists. 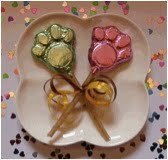 A carob free version of the ever-popular Chudgy Pops range, perfect for dogs who prefer white milky treats. A retro treat for dogs! Crunchy selection of eight freshly handmade puffed rice and milk and carob Dogolate™ cakes, decorated with Dogolate™ swirls and sugar and rice sprinkles. Heat sealed for freshness in packs of two crispy cakes. Presented in an elegant white bakery box with signature curling ribbons - also available with Happy Birthday ribbon, please select below. 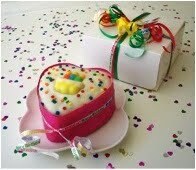 Each cake measures 5cm diameter, total box weight 260g. 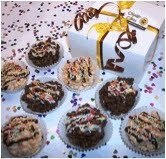 Since The Canine Confectionary Company is based in London, all prices on their website are quoted in pounds. Though there is currently no US distributor (attention all canine boutique owners! ), they will ship their treats overseas. For more information (or to start shopping now!) 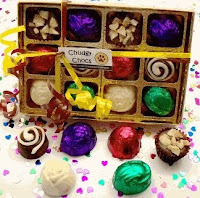 visit www.chudgychocs.com or send an email to info@chudgychocs.com. With their gorgeous packaging and attention to detail, there’s no doubt that any discerning Barkista would love to get their paws on these treats!